Featured contributors to this installment of the gallery are Kelsey Hurd, a student in the physician assistant program, and Terra Ambrosius Matthews, an osteopathic medical student. Both are members of the DMU Class of 2020. 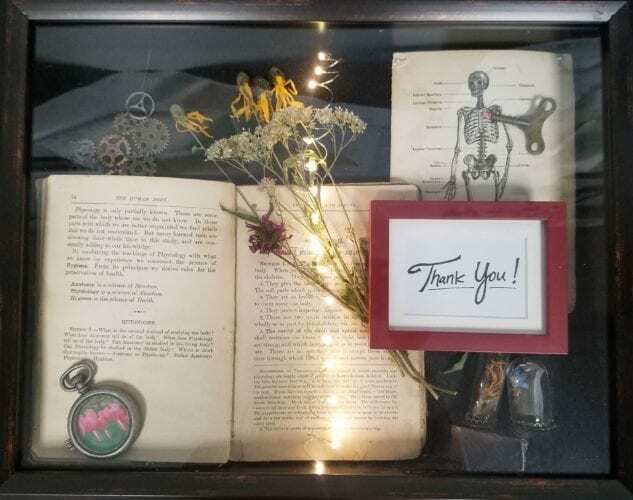 Kelsey Hurd – in her own words: This shadow box was put together for an anatomy project to condone appreciation and gratitude for my body donor learning experience. Each part is a symbol of my learning and the dedication of a person to the body donor program. I want to say thank you to my body donor for a lifelong experience that brought happiness, learning, and showed us her kind heart. The book is a student anatomy lesson book from 1886. The passage I chose exemplified the need to study the body to learn. It stated the need to study the living, the deceased, and in the very least studying a human skeleton is most beneficial. I chose the image of the skeleton as it is a common image associated with anatomy. The heart was placed with a key symbol to signify the heart is what carries a person’s being and soul. A body donor must have a heart committed to education and health of others. The flowers are a symbol of life, death and happiness. Bleeding heart is in the locket, prairie stars are yellow and the forget-me-nots in blue. They are to represent the pieces and parts that we observed through our dissections. The chain of gears is to represent the learning and cycle of knowledge that will continue beyond this experience. The light is to symbolize that through something considered dark, death, a light has been turned on. I am highlighting the service this person gave to others through her contribution to students. Lastly, I placed a thank you sign in the middle. I felt after placing the other items that it did not yet show my gratitude. I chose to directly say thank you as I did not feel there was another way to express my appreciation for such a commitment to teaching others. 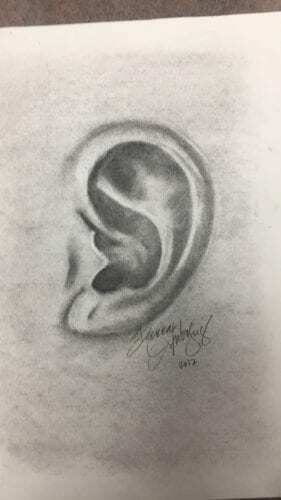 Terra Ambrosius Matthews – in her own words: Last year I was in an art class through DMU and as our “final project” we had to draw a close up of an anatomical structure, I drew an ear.